Meridian is a city located in Ada County in the US state of Idaho. 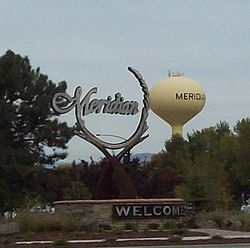 As of the 2010 census, the population of Meridian was 75,092 making it the second largest city in Idaho behind Boise and in front Nampa. A 2015 estimate placed the population at approximately 90,739. Meridian is the state’s fastest-growing city, with an 81.5 percent increase in population since 2000. Meridian is located at 43°36′51″N 116°23′56″W (43.614229, -116.398963). According to the United States Census Bureau, the city has a total area of 26.84 square miles (69.52 km2), of which, 26.79 square miles (69.39 km2) is land and 0.05 square miles (0.13 km2) is water. The majority of Meridian lies on a flat plain, roughly in the north central part of Treasure Valley. There is a low bench along the south east edge of the city. The city is crossed by several irrigation canals that generally run from the south east to the north west. The Boise River runs north of the city. The Snake River runs far south of the city. Squaw Butte is visible to the north at 5,873 feet (1,790 m). Shafer Butte is visible to the north east at 7,572 feet (2,308 m). The Owyhee Mountains are visible to the far south. Meridian’s climate is characterized as semi-arid with four distinct seasons. Meridian experiences hot and dry summers where temperatures can often exceed 100°F (38°C), as well as cold winters with occasional light snowfall. Rainfall is usually infrequent and light, usually averaging less than an inch (25.4 mm) per month. December is the wettest month with an average of 1.55 inches (39 mm) of precipitation, and August is the driest month with 0.24 inches (6.1 mm). Spring and fall are generally temperate. Roaring Springs is a large water park near the Meridian I-84 exit. Wahooz is a large family entertainment complex open year-round featuring go carts, bumper boats, miniature golf, batting cages, laser tag, bowling, an arcade and grill. The Village at Meridian is an outdoor shopping mall that opened in October 2013. It is home to retail stores, restaurants, a movie theater, a fittness center, arcade/bowling, and an outdoor ice rink (winter). There is outdoor seating and a playground surrounding a fountain that has a show every hour with lights and music. The Village at Meridian is located on Eagle Rd and Fairview Ave. Majestic Cinemas is an 18 screen first-run movie theater located SW of the Eagle I-84 exit. The theater opened in May 2005, and is privately owned and operated by Hallett Cinemas LLC. The city’s Parks and Rec department manages 17 public parks throughout Meridian including Meridian Settlers Regional Park which hosts free outdoor movies during the summer months. The Meridian Speedway lies within city limits directly south of Old Town Meridian. Meridian shares boundaries with the two largest cities in Idaho, Boise, ID to the east and Nampa, ID to the west. Therefore, residents of Meridian often take advantage of the recreation and sports opportunities in those cities. Eagle Island State Park is about 2.5 miles (4.0 km) north of Meridian and includes a man-made lake with a beach, equestrian and hiking trails, fishing, and a water slide. The Snake River Birds of Prey National Conservation Area is south of Meridian. During the summer months of May through September, the place to be on Thursday evenings is the Meridian Urban Market, also known as MUM by locals. This open-air Downtown Meridian urban market provides a neighborhood farmer’s market, artisan market, food-tasting, local art, live music and a beer and wine garden. MUM allows locals and visitors to engage in the local community life while also providing a long-term opportunity to foster urban development. The West Ada School District serves the city and is the largest in the state. 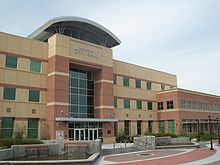 Meridian is part of the Boise metropolitan area.